So the new year has finally come and upon reflection, 2012 wasn’t so bad after all! I’ve been a [micro?] publisher for over a year now and have launched a new title: COPRA. Here’s a brief look back on the recent nods. Tucker Stone included my comics – Copra, Zegas & Deathzone! – in his sharp, personal Best Of list for The Comics Journal. Tucker has been more than instrumental in getting me through those first few Copra issues by saving me from comic book cabin fever. Big thanks to Matt Seneca and Abhay Khosla, too. Comics Alliance braved a massive look back in 5 parts, and Copra made the cut in Part 4 a.k.a. The Hellboy Memorial Awards. Major thanks to Dylan Todd, Chris Sims, Caleb Goellner, and Joseph Hughes for their continued support. Comic Book Resources had a multi part list of their own, and my comics snuck in there thanks to Timothy Callahan and Sonia Harris. Timothy also gave us his own Ten Best in his CBR column When Worlds Collide. I T E M S ! 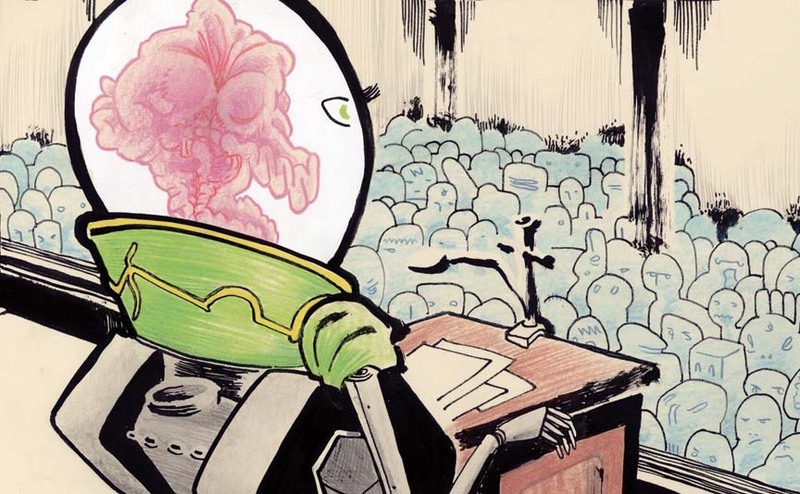 Alec Berry, in his new position at CBR, gave Copra a nice critical write up, which echoed his overview in his podcast, The Chemical Box, co-hosted by Joey Aulisio (Chemical Box contributor Shawn Starr also reviewed Copra). Jim Rugg and Ian Harker, their respective shout outs were much appreciated. I also spoke to Seth Jacob a little and Terrence Stasse Moreau broke it down, which is really a gross understatement considering all the thought and work behind his posts. To all the new readers who hopped on board this last year! Oh, and Annie Koyama, Zack Soto, Adrian Johnson and Chuck Forsman have been nothing but super cool from the get go. The biggest thanks go to Kat Roberts, who acts as the Copra Press house editor by proxy and a one-woman army of patience and inspiration. Last but not least, Bryan Galatis and Erik Mallo have lent their talents to making those fun short video clips every time a new issue comes out. Here’s the latest. And just for good measure, here’s the trailer for the previous issue, which didn’t grace – no pun intended – this blog all month. I’m deeply touched and inspired to keep on doing my Copra thing thanks to all your awesome feedback. All you readers have been really great and I’m very excited to keep making comic books for you to read. Here’s to 2013. Please get a digital release for COPRA out. Your work deserves to have a wide audience.